Some of you might remember that earlier this year I signed up for the 100 Day Project. I was intending to write about the experience and interestingly it’s taken me a while to get around to it. Some of the delay is due to being busy over the summer, but I also think that it has taken me a while to consolidate on my learning because there was so much to take from the experience. I signed up in a fit of enthusiasm. Well, during the course of the 100 days or so that enthusiasm waxed and waned. What I can say for sure is how much I have learnt from the process. Initially I was using some of the principles learnt from the online workshop I have been involved in, run by Nicholas Wilton from Art2life, that took place at the beginning of this year. My focus was mainly on what Nick calls design, or composition, and value. He highlights how important differences are in composition. Differences in size of mark, shape and value. The project I decided on was to do a small abstract collage in my sketchbook. I was hoping to develop my art practice in two ways from deciding to make this my project. Firstly to use all my learning from the course and secondly to learn about using collage. Part of the process I found particularly helpful was to go back through my sketchbook and make notes as I was going along. Some were very just short, just a line of two, others much longer as I found my reflections led me deeper into thinking about my work. Looking back over the sketchbook there was a clear development in the collages. I began with small pieces on individual sheets. This was the first day, a very simple collage. My notes were about needing more differences in the size of shape and value. Some of my main learning was about how to use larger shapes, to be bolder in my compositions and through the daily practice I developed a range of shapes that were more random and unusual. I also discovered how much l like to layer collage onto collage. I particularly like little bits peeking through giving a sense of surprise or mystery as to what lies beneath. In the image to the right you can see the use of layering along the bolder shapes. In this piece I was also making use of handmade collage papers along with bought in materials. I enjoyed the contrast. Another technique I became interested in was to go outside the edges. To use a separate sheet for one part of the collage, to then mount that on a plain piece of paper and then to continue to develop the piece. Here’s an example. Looking closely, the lines are drawn over a central piece and extend to the page it is mounted on. The red shape also extends over the edge. I was able to experiment with using new materials – large graphite sticks and fabric for example. I also made use of found objects. Some more successful than others. A paper post it note from the floor – not so successful. The ticket stub from a dinner and dance I attended – more successful. What became obvious during the process has been the importance of continuing experimentation and play. I noticed that there is a part of me that had a secret fear that my creativity might dry up. That there is a finite well of ideas. However I can confidently say that just the opposite has proven to be the case. For example the collages where have collaged over the edges feels like it might be a new sort of format. I’m now thinking of how to translate this into a multiple layered larger piece. I’m not sure when this will happen in my larger work, but I think it will find a place. During the 100 days I also did some slightly larger pieces of collaging as small complete pictures. These are now for sale in my Etsy Shop. Meanwhile what next? Something of a rest I think. Will I do it again? As an intense period of learning that boosted my art it was invaluable so, yes, I probably will. Did you take part? What was your experience? What was the biggest learning? Interested in bringing some collage into your work? 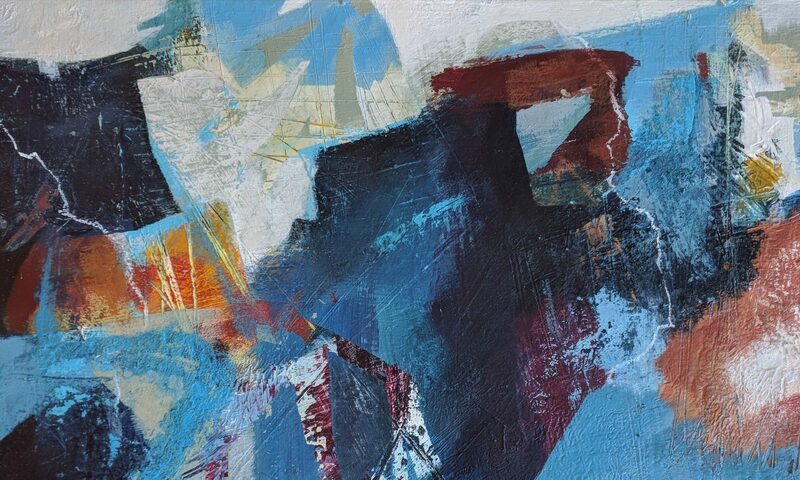 Then book onto my Colour, Collage and Texture in Abstract Painting Workshop.